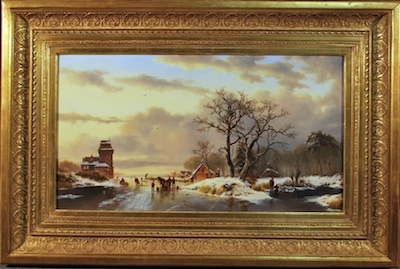 The art conservation on this beautiful Dutch Old Master, oil on panel, was just completed for an art collector in Las Vegas. Even though it was a pretty painting, I think he bought it for a very good price at auction because it had a lot of retouching on it and was covered with a discolored varnish. During the cleaning of this painting, we took off all of the previous retouchings and then only put back on a fraction, carefully restricted to damage, which we assume increased the value. We also cleaned the old discolored varnish off to reveal the glow of the original. This was really treat to see completed. The Victorian frame is not original, although it is beautiful… or used to be before someone “restored” it some time ago with goopy gold paint. While the painting was being worked on, we had the frame restored too. It was stripped of the ugly gold paint and was re-leafed with 23 k. gold and antiqued to a period finish, similar to its original finish. The frame is from the middle of the 1800’s. The painting is from a hundred years earlier. This entry was posted in In Lab and tagged art collector, art conservation, art restoration, cleaning an oil painting, Dutch Old Master. Bookmark the permalink. I love the Dutch Old Masters.